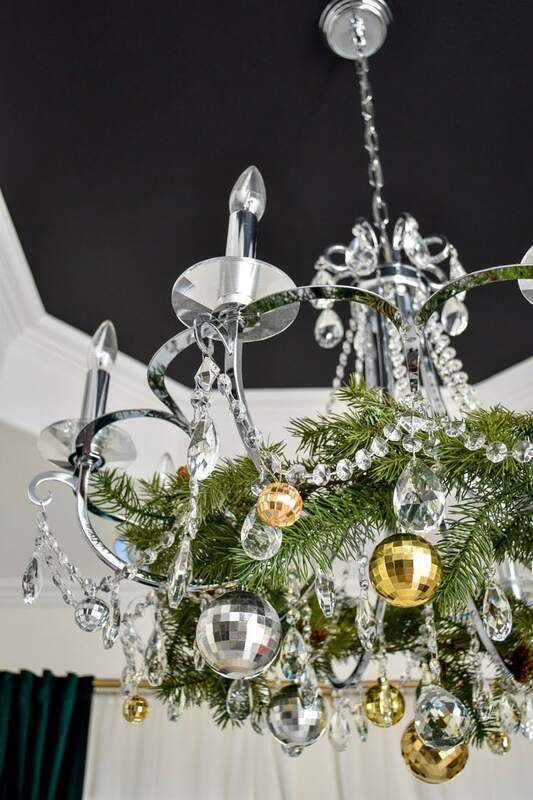 We all look to the usual spots to place holiday decor: doors, trees, stair rails, mantels and tables, but I encourage you to look up and think about your chandeliers. 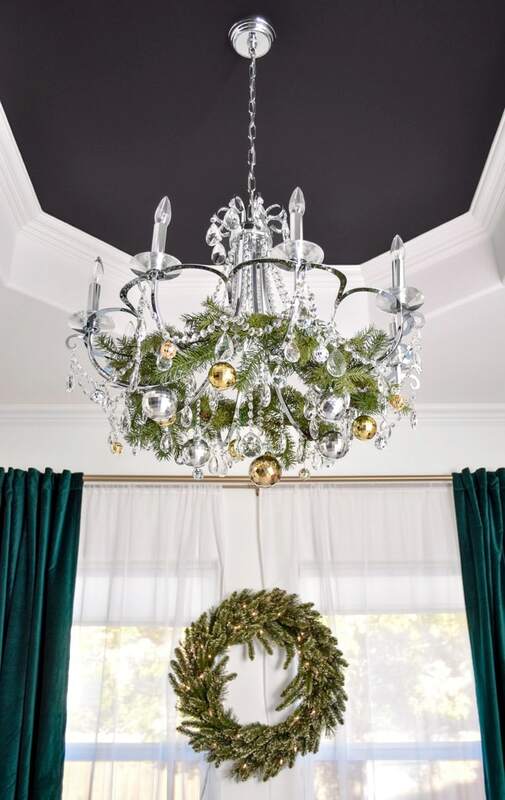 Chandelier Christmas decor ideas is what today’s focus is on because it’s an easy decor project that can take as little as 10-15 minutes. Decorating things you already have in place, such as chandeliers, light fixtures or wall sconces, is much easier than dragging a bunch of stuff in. Back in 2013 for the Home Depot Holiday Style Challenge, I used some fishing wire and strung additional ornaments onto my chandeliers in my dining room. I also draped some simple gold and silver beaded garland to complement the metallics I had going on in that year’s color scheme. This year, I used a left over “floppy” garland- one that doesn’t have a rigid wire to work with. You could use a heftier traditional wired garland, but I feel these inexpensive, non-lit lightweight garlands are perfect for this sort of application. I love how the little branches poke through and cascade down for a chic, imperfect vibe. The garland I used for this chandelier Christmas decor is from Michael’s and was $10 on sale, plus it has mini-pinecones. 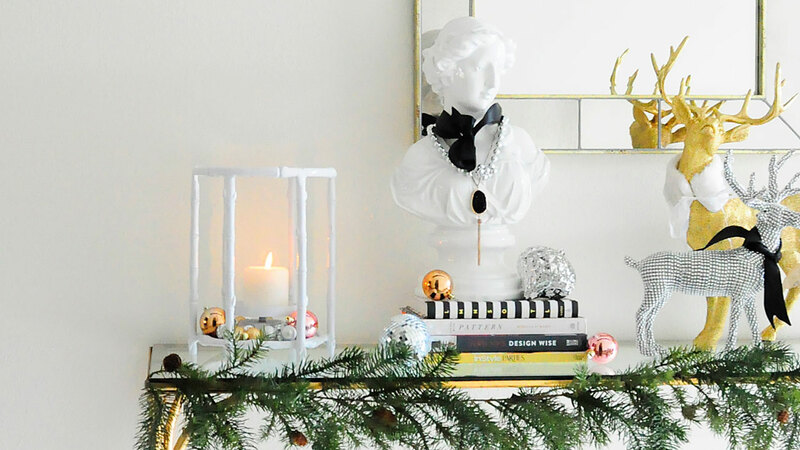 I used it last year in my blush and gold Christmas foyer on my bamboo console table. 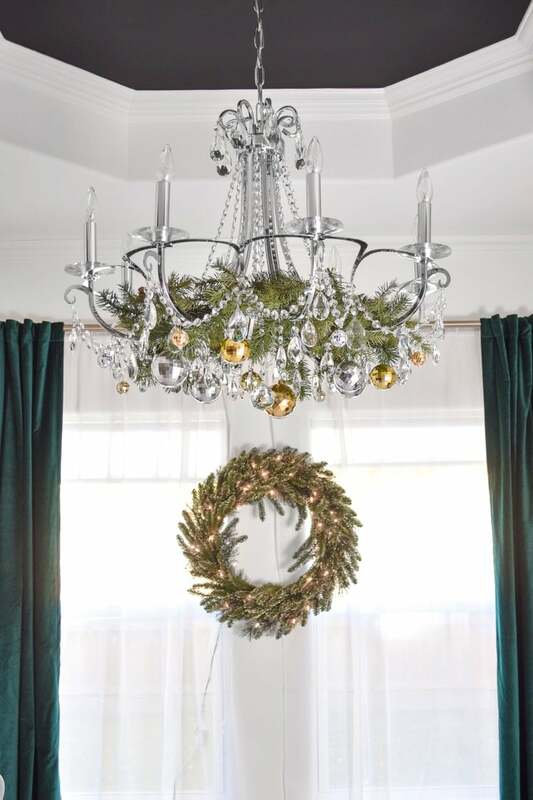 If you want a super simple look, you could fluff the garland into place around your chandelier and be done, but I wanted some glamour, as usual. 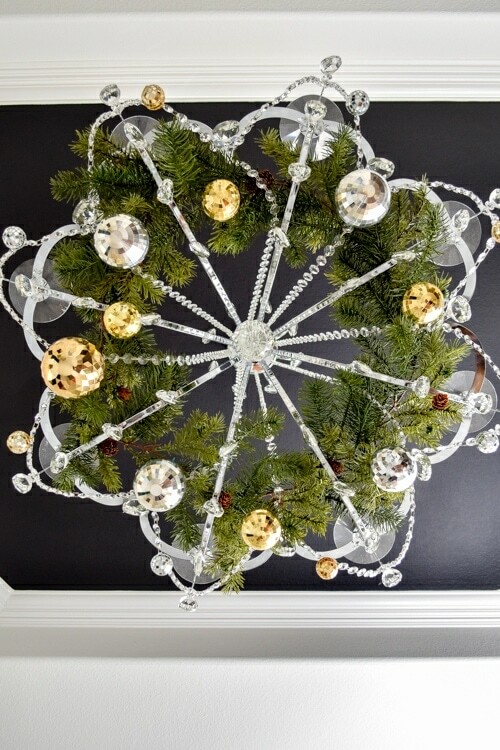 My chandelier is traditional in that it is essentially a “round” shape, which makes adding ornaments a breeze. I decided to look at my chandelier like a clock and place ornaments at each hour. Overall, I used 12 large ornaments and 12 mini ornaments in shiny gold and silver disco ball finishes. 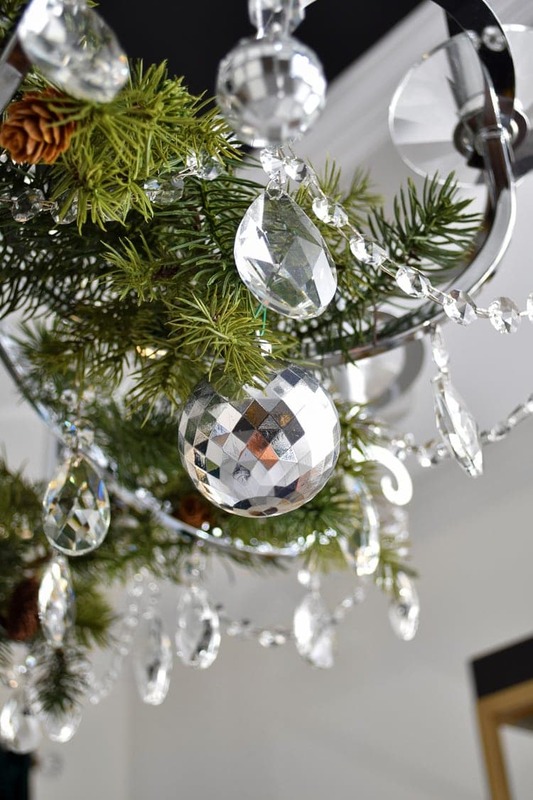 The large ornaments are hooked onto the garland using dark green Christmas ornament hooks, and the smaller ones are simply hooked into one of the connectors that hold the crystal swags. 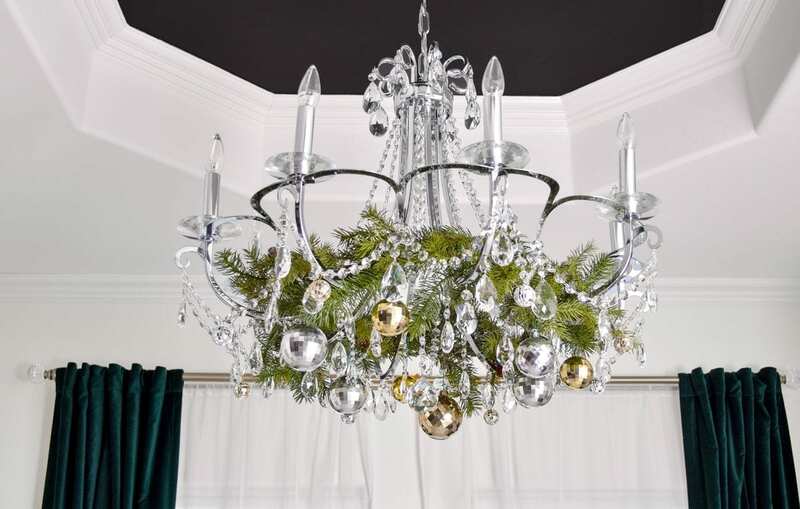 The result is a very glamorous, sparkly chandelier that is decked out in holiday decor that is very easy to remove. 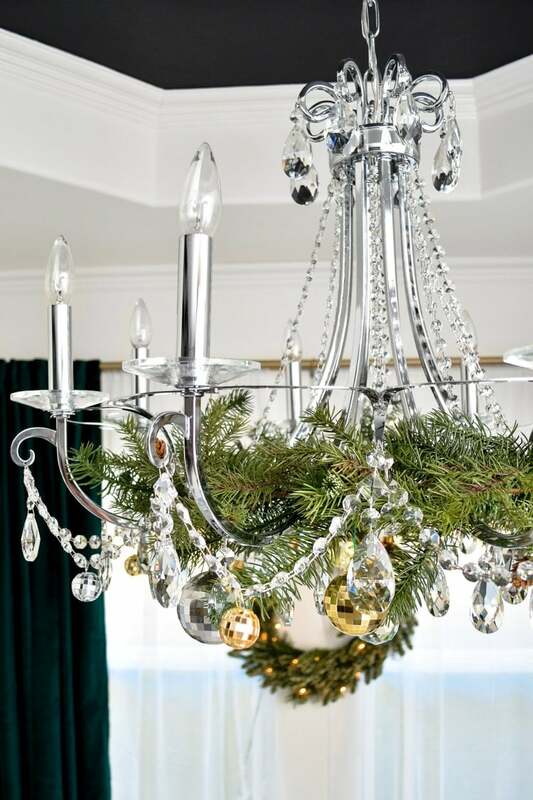 I highly recommend your chandelier Christmas decor be simple to add AND remove (don’t use anything terribly permanent), place all decor away from the bulbs and make sure it’s somewhat lightweight relative to your chandelier’s size and weight. Last year in this dining space we had a small Christmas tree, and this year I opted for the decorated chandelier, wreath between the windows and some decor on the gold etagere we moved over from the living room. 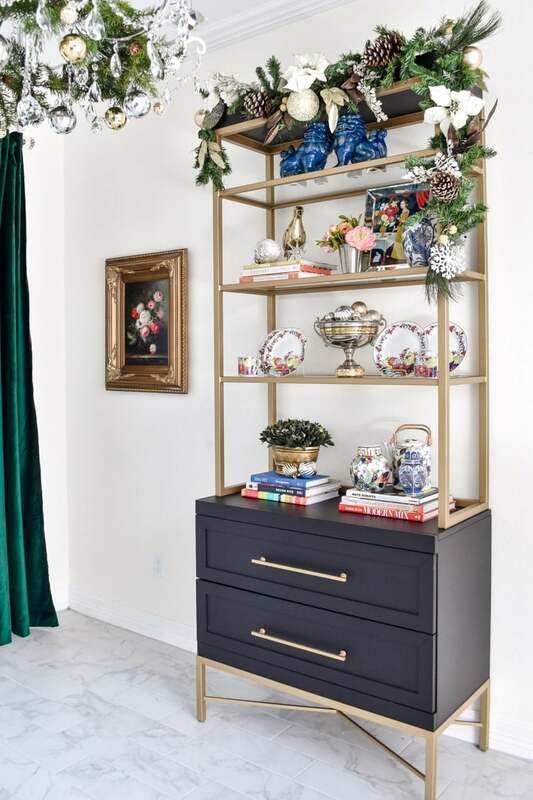 Here’s a sneak peek at the styled etagere. I adore displaying my ever growing collection of tobacco leaf dinnerware. I’ll be showing more of my dining room during the rest of my holiday home/room tours next week. I also may have a new dining table in this space in early 2019 thanks to West Elm’s Cyber Monday sales. I have a tiny sliver of hope that maybe it’ll come in before Christmas, but in all likelihood, it will not. 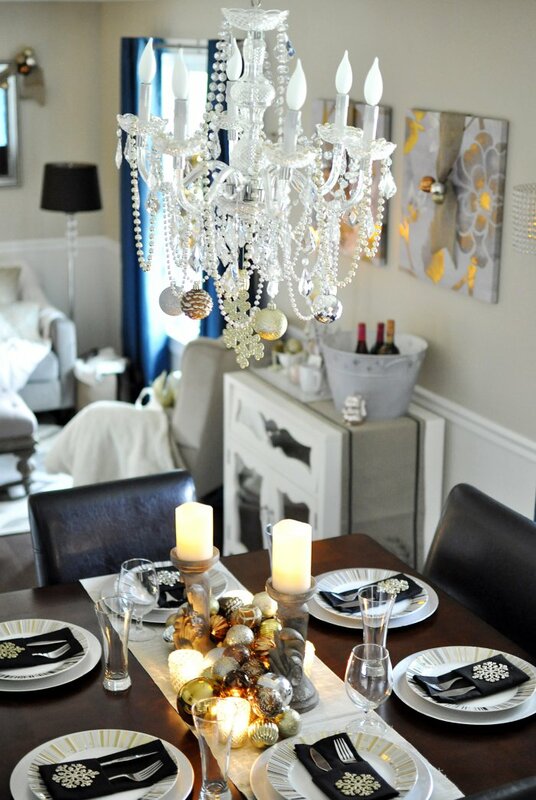 That’s ok, because I can enjoy this chandelier Christmas decor in the meantime. If you need more affordable, easy and glam Christmas and holiday decor ideas/tutorials, please check out my Christmas DIY page. If you have any ideas for future tutorials, drop me a comment! Later this week I’ll have a fun dollar store DIY for versatile gift tags and another post with bar cart styling tips for your holiday soirees. xo.